Hi Kathryn, are you sure you’re actually buying Asclepias tuberosa? 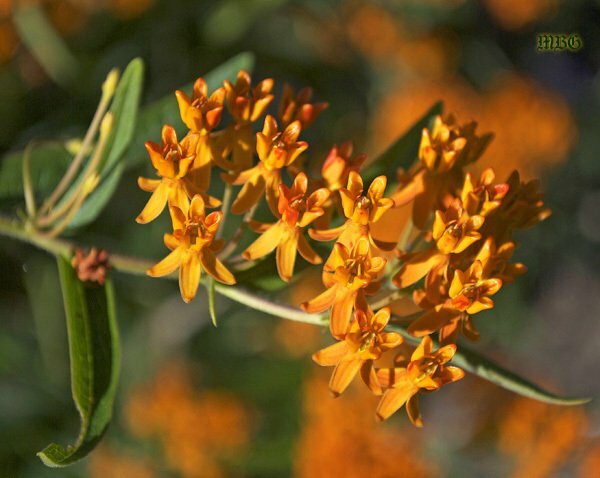 Some nurseries use butterfly weed to label tropical milkweed plants…Asclepias curassavica is only a perennial to zone 8 and up. Help! My butterfly weed has aphids. What can I use to get rid of aphids and not harm the caterpillars (if I ever get any). I just planted these and then read where the leaves and stems could be poisonous to animals. Is this true. I have dogs that like to eat leaves and grass. If this could hurt them they will hit the garbage. Can you delete the comment suggesting tropical milkweed as a host plant or at least point out that it should only be used in the south? It’s hurting migration and causing health concerns. I’m trying to combine common milkweed with butterfly weed but I’ve noticed that fireflies house on the common variety. Will that cause my monarchs problems? Should I create a caged house? I was trying to go a natural route. Also, my backyard floods and then dries after receiving 40mph winds. Can swamp milkweed survive the chaos if I plant it near or around arborvitae? Is it invasive? Will it harm my arborvitae? Hi Beth, tropical milkweed is an excellent option for attracting/supporting monarch butterflies and I’d argue that it’s more problematic in continuous growing regions where it collects more OE spores than native milkweed becuase it doesn’t die back. There is no actual data to suggest it’s negatively impacting the migration. We’ve grown it for almost a decade and monarchs are not staying late because of it. They are depending on other environmental cues including wind direction and daylight hours. I’ve never seen (or heard of) any issue with planting common milkweed and butterfly weed together but keep in mind A. syriaca spreads aggressively through underground rhizomes. We raise indoors becuase it’s easier to protect caterpillars from extreme weather conditions and predators. Also the newsletter signup would not allow me to sign up it continued to tell me the address was invalid. Checked it and re-entered and it continued to fail. Had a nice butterfly milkweed plant last year, but it didn’t come up this year. So I dug up the area and found good roots, but appears rotten where the plant was. What would cause this? and, can I replant the roots and get them to grow? Hi Mike, perhaps the area was too wet…not well drained soil? Yes, if the root system looks viable, you could try planting it and hopefully it will come back next season. Butterflyweed breaks dormancy later than anything else in my garden, so I’ve learned to wait patiently, and in the fall mark where they are so I don’t accidentally dig them up. I take a wooden stake, cut it into 3 parts, and stake around the plant so I avoid tilling that particular area in the spring. I just bought a butterfly weed plant. I grew them many years ago in my “urban garden”, where they only had about a foot to a foot-and-half patch of grass, with a fence on once side and concrete on the other side. I was planning on planting my new little plant next to my concrete patio, but after reading about the roots am concerned this may not be the best place. It is the best place in terms of sun and not getting mowed over by idiot lawn mowers (I just had my lilies in front decimated the other day). Do you think it would be okay to plant them maybe a couple of inches away from the patio and have them do well there? They will get plenty of sun, although the soil in Ohio is pretty clay-ey (but then, I was in Ohio when I grew them before too). Should I add some compost to the hole I will plant them in to help with the high clay content of he soil? Thank you for any help! Hi Ginger-lyn, it sounds like you have found a good place for your plants. If you’re concerned about soil quality, amending with compost is a good idea. I recently planted two small butterfly weed (about a foot high) and one has been eaten to the stems by cats (moved them all to the other plant that was untouched and going out to buy more tomorrow). Is the plant that was eaten down a goner or if I cut it down will it come back? I live in Central FL. Unsure what is best route to take with stripped plants. Thanks! Mi Michelle, if the milkweed plants have good root systems they should come back. I would give it some time and see what happens…good luck! My butterfly weed does not show signs of life (April 29), it shows no signs of spring shoots. Does this plant start in the summer? Or should I be worried about it not looking a bit green. Hi Veronica, not sure where you’re located but I haven’t seen any of our tuberosa plants coming up yet in Minnesota…they usually take a little longer to emerge than other milkweed species. new shoots will emerge from the ground. I live in Sacramento, a pretty hot place. I bought Asclepias Tuberosa last October and planted it in my backyard. The foliage died off over the winter. It is now April and I keep waiting to see new growth and I haven’t seen any yet. When should I see new growth on it and is there anything should be doing to get it to start growing again? I bought 4 Asclepias Tuberosa plants to add to the milkweed in my yard. I figured the caterpillars would like it since the plants have thinner, more delicate leaves similar to Tropical. However, I have not found a single caterpillar on the plants even though they are nice and bushy now. I’m finding cats on complete stripped Tropical, but none on the Tuberosa. I cut some Tuberosa stems to feed the cats in the castle, but the cats won’t eat it. They will eat literally everything else and leave those leaves alone. They will even eat the leaves from the Giant milkweed tree which are much thicker (and I am assuming harder to eat) but leave the Tuberosa. I swear if I hadn’t found caterpillars on the plants when I bought them, I would think that the nursery sold me the wrong plants. I hope the butterflies like the flowers, because the cats sure don’t like the leaves. Hi Bett, in a side by side taste test with other milkweed varieties, it won’t fare well. But if the eggs are laid on it, and the caterpillars haven’t been eating other varieties, they will be fine with it. Which specific variety would you recommend for Colorado (Boulder area) and for Wyoming (Cheyenne area)? Thanks! I have switched five caterpillars from one milkweed to another and my babies haven’t moved since. It’s been from about noon yesterday until 5:30 this morning. The first plant was from Home Depot and the second plant which is much more mature is from a nursery. The plants are the same kind but the first one is a much younger plant. I’m devastated. Should I move them back to where they were? Hi Gina, I hope the new plants have not been treated with pesticides. If they still aren’t eating I would move them back…good luck! Yes, immediately move them back. The Home Depot plans, virtually ALL of them, are treated with a neonicotinoids. Some plants are labelled, but I’ve seen many labels on the floor as they get knocked off. Its disturbing that even indoor plants are treated this way. I would not trust anything from HD unless they pledge to not do it any more. They have made murmurs of doing so, and have made a few concessions, but its not universal. This would be outright poison for your poor caterpillars. Do you think a Home Depot butterfly weed plant would be safe during a second growing season if cut back to the ground the first year? it should be fine, or at least much less toxic than when it was treated. if you’re unsure, you can always test with 1-2 caterpillars before feeding more…good luck! Last year was my first go around with monarchs. My good intentions to help preserve the Monarchs by buying tropical from HD was rewarded by getting tons of cats and all of them died in a few days and a few lasted a few weeks before dying off. I blamed predators but eventually realized it was probably pesticides. We cut them back and the second go around ( in the same season) I had no problems at all and had cats well into the fall who were healthy. Hope this helps. you can always test the milkweed on one or two caterpillars…not all big box stores have milkweed treated with pesticides, but many still do. The seed pods on my butterfly weed plants are not drying or opening…they’ve been hanging out on the plants for a month doing nothing. All the milkweed seed pods have opened but these butterfly weed pods – nothing! Do they take longer to mature? Hi Sheila, our Asclepias tuberosa pods haven’t opened yet either. I would wait to harvest until you see them start to crack open…good luck! Can I grow it in a large pot?? Yes Nancy, I haven’t grown it in pots before because of the taproot but have seen others do it successfully. good luck! I have had my butterfly weed in a large pot and it’s in its second year. This year it is now on its second blooming. The first browned out in mid-July and then fresh shoots emerged and is now in full bloom. I take it as a good sign that what looks like a monarch caterpiller is now attached to one of the orange buds. May I transplant the plant when it goes dormant or wait until after the last frost of spring? I have a seed pod (1st ) on a 3 yr plant and would like to reseed directly into ground. My question is when to open pod and do I let seeds dry first then plant? Also do I have to do anything to the ground beforehand? Harvesting milkweed seeds good luck! Will a Monarch larva eat another type of Milkweed other than the one it started on? Thank you. I’ve been having a bit of a runaway problem. But it seems the older they are, the easier the switch. I have butterfly weed plants that look healthy, they are about 4 feet tall. I have some in Memphis, TN and in Camden, TN. It is August 8, and I don’t have any flower buds, much less any flowers. What’s going on? We had lots of rain in both cities in the spring and during a very hot summer. Tony, almost all of my first year tuberosa are now blooming! The funny thing is, nearly all my first year incarnata are setting bloom buds too. Guess I got lucky. Hi Arthur, if you started from seed that is pretty amazing…enjoy those beautiful blooms! Yes, all started from seed late this winter / very early spring. Very pleasant surprise! I believe a tuberosa is in my garden. I did not plant it, but it showed up as a volunteer. This is its third summer and has not spread. This summer I bought a Pentas (Pentas lanceolata) from a local garden store. I was told it was butterfly weed. Is this true? Will Monarchs use this as a host plant? Hi Stevie, pentas are a nectar flower but not a monarch host plant. Not knowing they are tap rooted plants, i pulled some plant stems off the main root. The stems have minimum roots on them. I was hoping to reroot the stems. Am I able to do this? If so, how? Thank you! I have several A. tuberosa seedlings that I started in late Feb / early March from seed bought from Walmart. I had very good germination both with and without stratification, and good survival so far. I noticed yesterday that one of the bigger seedlings is working on a head of bloom buds. I didn’t expect any of them to bloom this year. Should I allow it to bloom, or would it be best to pinch the bloom buds off? Hi Arthur, why would you pinch back the blooms? Enjoy the unexpected surprise! Thanks Tony. Most of my growing experience is with carnivorous plants, where when a young plant blooms it is often recommended to pinch off the bloom buds so the plant can put all that energy into growing instead of blooming. In this case I will indeed enjoy the unexpected bonus! Hi Arthur, your tuberosa plant shouldn’t grow that much its first season anyway. If you had two first year flowering plants, I would suggest an experiment. Tony, two more of my first year tuberosa are now putting on bloom buds. I would be interested in your experiment suggestion. Hi Arthur, just try pinching one or two of them back, and leave the other to see the difference in growth habit. Our mature tuberosa plants have two bloom periods and we don’t pinch them back at all. I moved into a new home in San Marcos, CA a few months back and purchased a couple smaller Asclepias curassavica plants (about 12″ tall). I noticed this past weekend that I had a number of monarch caterpillars on them, and now they’ve entirely devoured one plant down to branches only and I’m pretty sure when I get home from work today, the other plant will be entirely eaten. I have at about 10 caterpillars that are about an inch and a half long each. Do you think that they’re now big enough to survive without purchasing more plants (these were $12.99 each… yikes!) or should I purchase more in order to keep them alive? I’m not sure how much more they need to grow before they build their cocoons. Thank you! 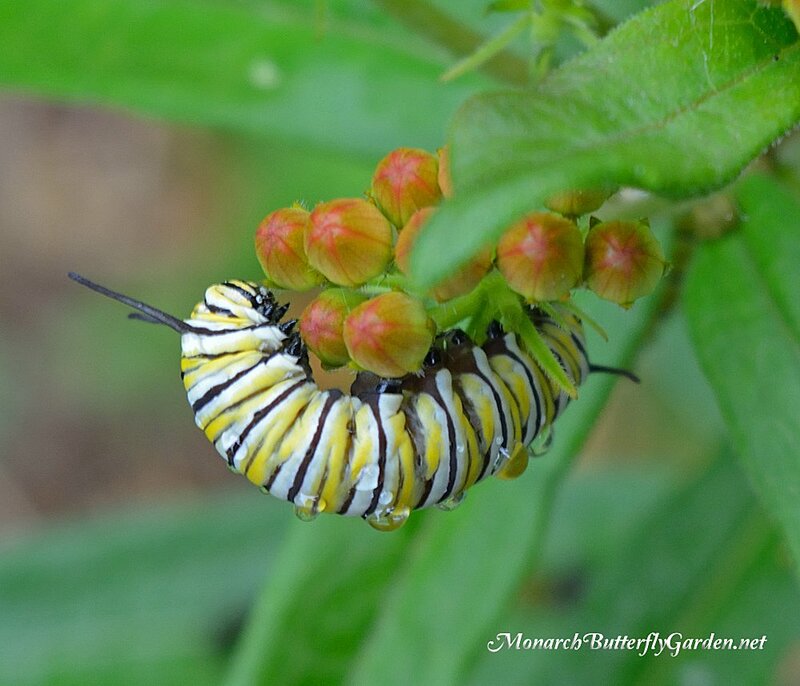 Hi Marcelle, just 1-2 caterpillars can devour an entire milkweed plant so I’m sure they will need more milkweed. good luck! 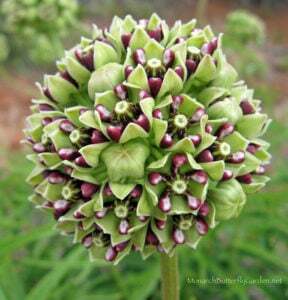 I received a packet April 21, 2016 of Pink Butterfly Milkweed Asclepias tuberosa seed at the District meeting of the Montana Federation of Garden Clubs. The package is from Golden autumn The farm. I put some seeds in water. I stratified some seeds. More sprouted with the stratified method. My question is “What does the sprouting Asclepias tuberosa look like? Some of the seeds have long narrow leaves. Some are more oval. Which one is the A tuberosa? Some of the sprouts are now 1 1/4 inch tall and I am planning to set them out in my garden which gets morning sun. Do I put both of the starting plants? We planted three (orange-flower) butterfly weed plants in Central Vermont (zone 4) last summer, in full sun, and they grew pretty large and flowered twice over. A lot of people up here were surprised they’d done so well. In late Sept/October, however, they were seriously attacked by orange aphids, which I tried to hose off as best I could. Pretty soon after the stems seemed to dry out and the plant turned black and fell apart altogether. First frost probably helped too. So I figured they were dead and cut them down to the ground. But in fact they were only dormant, as all three have new growth as of a couple of weeks ago, which is thrilling. So I bought six more (not easy to find, had to go to four nurseries, and they were very pricey) and planted them this past weekend in another location, to see how they fare. Anyway, my question is: Can aphids damage the plant, and how can we best get rid of them? I’ve read that some people use insecticidal sprays, but would prefer to avoid, especially since this area of the garden is approximately in the location of our underground water tank. PS…large aphid infestations hurt the plants and decrease seed viability…typically, they don’t kill the plant. Thanks for the link, Tony, much appreciated. Good to know that the aphids don’t kill them, even if they do damage, alas. We did notice quite a few ladybugs last summer, the kids loved them, and I’m hoping they’ll return. Thanks again. Glen. Do you know if I could still buy milkweed plants (not seeds) somewhere and plant them to attract butterflies or is it too late? Quick ? for you, I have three balloon Milkweed plants in my garden, and the balloons are collecting Box Elder bugs, that I believe are coming from my artichoke plants. What can you tell me about why they would be on the balloon Milkweed, and how to get rid of them. I know they are a pest, and I can’t afford to get an exterminator out here. I had As. tuberosa in my main b-fly garden and it wasn’t doing too well – I think it was being overshadowed by the taller milkweeds. So last year I dug it up, split it into 2 clumps and replanted them into a small plot in my front yard. Oh boy! Was it happy there! It grew a bit taller and I rescued a dozen cats to bring in to my rearing cages. Hope it does as well this season. Thank you for sharing your experience Dottie…sometimes a new spot makes all the difference! Hi Tony, did you keep records of time into water on heat mat and beginning germination? I’m curious as to approx time from beginning to first seeds sprouting using your water germination method. Does it provide a quicker way to germination? Hi Mary, it took over a week, but it was cold downstairs and my heat mat wasn’t working…it took me a few days to notice. Once the water warmed up a little bit most of the seeds germinated as you can see from the photo on the page. Again, I did not cold stratify the seeds. 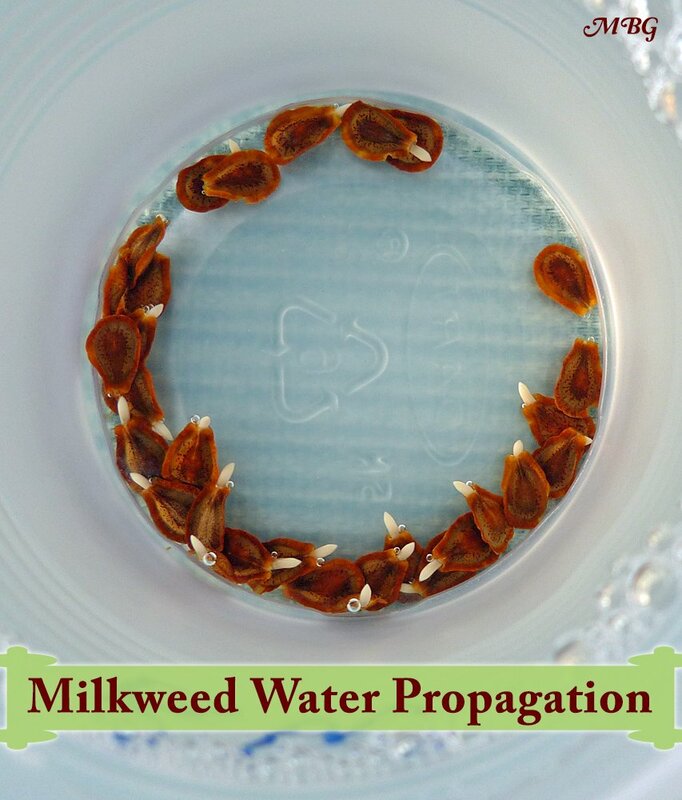 Next spring I am going to try soaking some in water for 24 hours like I do with the warm weather milkweed varieties. Hi Brian, congrats on your tuberosa seedlings. Fresh incarnata seeds generally have a high germination rate. Have you tried a heated seedling mat to speed things along? The 30 day moist stratified seeds of tuberosa germinated very readily in soil the incarnata have not done so yet. Over the past few summers I find a few instar on the tuberosa leaves. Happy almost spring. Thanks Tony. The funny thing is, about a month ago I put some of my wild collected tuberosa seeds in a water container to try that method, no sprouts at all yet. Two incarnata seeds out of twelve have sprouted that way, and none of the syriaca. It could well be. I have one ordered, will try again after it arrives. Every year I see “Butterfly Weed” (which I assume to be A. tuberosa) seed packets at Walmart, and always wonder how well they would germinate since the packet instructions make no mention of stratifying the seeds. This year I decided to try it and see. I planted 21 seeds in peat pellets in a plastic dome and placed under lights on my growing rack. I did not soak the seeds first, and I do not use a heat mat, took the seeds straight out of the packet. This was this past Saturday, the same day I bought the seeds. Last night, Monday night, I noticed that almost half of the seeds had sprouted already! I never dreamed that I would get such good germination, and so fast. Now I’ll have to grow them out and compare to my wild collected A. tuberosa and the seeds that I bought online, which are now all stratifying in the refrigerator. I just thought someone might be interested in my little experiment. Tony, do you have any thoughts on why these would work so well without any stratification? Hi Arthur, tuberosa is one of the easier seed varieties to start. It can also be started in wet paper towels/coffee filters in a sealed food storage container or in water under grow lights…both without cold stratification. I am currently experimenting with these propagation techniques and tuberosa is responding well. Even a decade ago, there wasn’t a lot known about gardening with milkweed. Through all the social networking on the internet, there is a lot of new information coming to light that is blowing old assumptions out of the water. Experiments are good…thanks for sharing your results. About to have our first freeze this year, I can’t remember if I’ve cut back my milk weed in prior years. I live in Zone 9, Houston, Texas area. Can you advise? Frost has wilted my butterflyweed. Do I cut all the way back? Hi Trish, if you’re in a region with a true winter, just cut back the dead foliage/stems in spring. new growth will emerge from the roots. I started Asclepias tuberosa from seed in seed trays. End of December brings a wonderful germination and I have them under grow lights. Should I keep the plants cold to control growth till my zone 5 garden is ready? I assume that they wouldn’t do well if I planted them out before the last frost. Hi Stacy, if we start native milkweed seeds indoors it would be about 8 weeks before planting outdoors. I’m not sure how that will affect the growth cycle, but it sounds like an interesting experiment. You might also want to try an alternative form of propagation like winter sowing in case you have any issues with these early plants. Let us know what you learn from the experience…thanks! I’m looking to make my garden friendly for both butterflies AND honey bees – if I’m trying to appease them both, would this or syriaca be a better choice? Hi Heather, bees are frequent visitors to both types of milkweed but syriaca is typically more attractive to monarchs as both a nectar and host plant. The one advantage to tuberosa is it blooms a bit longer. There are many milkweed varieties to choose from and having 3-4 species planted will attract/support more monarchs and other pollinators. My milkweed plant leaves have all been eaten by monarch caterpillars and only the stems are remaining. I live in Florida. Should I cut the naked stems back now? 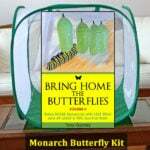 sounds like a good time to do this Leisa…congrats on a busy monarch season! I have the same issue. They are bare and look close to death. This happened in about two weeks. How do I “cut them back”.? Not sure of how to ensure they don’t just die…. Few weeks ago bought a Milkwee plant at the Local Agric. Ctr. plant sale … the Milkweed is in full sun. Did as the Ag Agent said .. fertilized just a little and watered lightly for a couple of weeks; half of the plant is now brown and leaves have fallen off. The other side is fine. Any suggestions? Am in Central NC and this is supposed to be a native for this area. Enjoying reading these comments about butterfly weed. 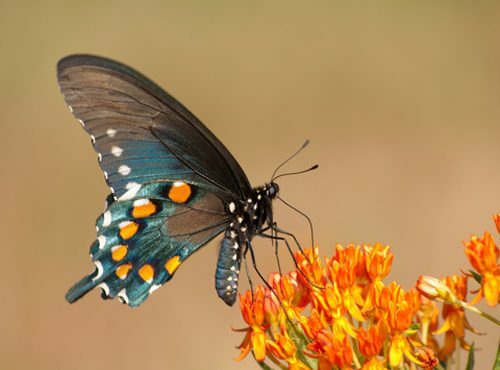 Many folks may be aware that Robert Frost, in his early poem, “The Tuft of Flowers,” on the subject of haymaking, makes reference to butterfly weed; in this poem, the butterfly plays a central role. My butterfly weed had a lot of green leaves, stems left, but also many brown dead stems, so I cut them down like i do every fall. I noticed extremely tiny orange spots all over every stem and leaf. What are these? This is our first year to plant a butterfly garden. We live in a suburb of Chicago. We have many Milkweed plants in our area that grow wild and quite a few that have come up in our yard. We picked an area next to our house and planted butterfly weed and butterfly bushes. There is also Milkweed intermixed. A friend gave me 2 Tuberosa plants – one orange and one yellow. We’ve been very successful attracting Monarch butterflies. Out of all the plants, they seem to prefer the Tuberosa plants. I’ve had as many as 7 Monarch caterpillars on one plant and they have eaten them bare. So far we had 4 pupas. Two have hatched open on Labor Day. 2 pupa were on our Butterfly Bush and the other 2 attached to our brick windowsill. 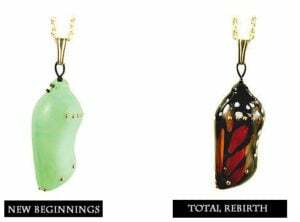 I believe there are more pupa but they are so well hidden, they are hard to see. It is such fun watching the stages of the butterfly. Hi Heather, I think this is a common Florida issue but I’m not sure why it happens. I would contact a reputable nursery in your area or the master gardener program in your area to talk to someone with first-hand Florida experience. good luck! Ps…you can cut back any milkweed variety for a bushier growth habit, but I just let the caterpillars take care of that. what’s eating my butterfly weed? not monarchs! Masses of caterpillars which are about an inch long with an intricate pattern of light brown and black segments and white horns. When do you trim them? Or do I need to. Thanks…I have fish emulsion so I’ll give it a try. The reason I hadn’t tried fertilizer before now is that I thought milkweed thrived in sandy soil that wasn’t amended with compost or fertilizer. Good to know that fertilizer may be a solution. One last question: should this plant be cut back to encourage blooms? Hi Susan, I have never cut back our tuberosa plants before. As they have matured the past couple seasons, they are putting up more stalks (and blooms) on their own without extra encouragement. You could always try cutting back one or two plants to see if you notice a difference in growth habit…good luck! Feel so fortunate to come across your column. Thanks for all the good information. I planted a milkweed plant last fall. It bloomed beautifully this spring but since then nothing. Should I fertilize? I live in central Pennsylvania. Hi Susan, you could always try a fertilizer that promotes flowering to see if you could get some more blooms. I was actually surprised to see one of our tuberosa plants going through a second bloom cycle…I can’t recall ever seeing this before. Hi Gail, you can use fertilizer on milkweed. We’ve used slow release, seaweed/fish emulsion, and miracle gro in the past and have never had any issues. I also know other gardeners that use fertilizer and have not heard of any potential issues…as long as there aren’t any pesticides in the ingredients, fertilize away! Just to note- miraclegrow DOES have what can be a pesticide -chemical salts & a herbicide in some cases of native plants. It seems counterproductive to introduce chemicals where endangered butterflys eat. I’ve used miracle gro fertilizer for many years and had zero issues with our caterpillars/butterflies and have talked to many others who gardeners who report the same experience. Miracle Gro is 100% pesticide free and contains nothing harmful. I use their “Quick Start” to help establish milkweed. I am thinking of removing my butterfly weed altogether and replacing it with another variety. I have A. syriaca and A. incarnata but the Monarchs don’t even go near A. tuberosa. Forget about feeding it to caterpillars… they would starve! Love your site by the way! Hi Kate, I’m not a huge fan of tuberosa, but we have a surprising amount of monarch activity on ours this season. 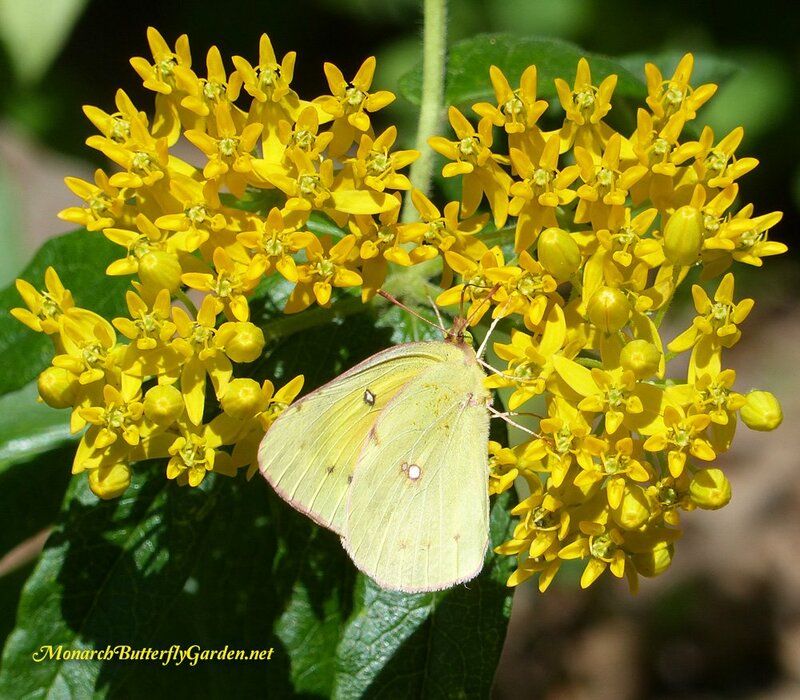 It never hurts to keep a couple of even the varieties you don’t like…you never know (for sure) what’s going to entice visiting butterflies and why. Good luck with your garden! So exciting. I have both Butterfly weed and regular milkweed. No Monarch cats but my next door neighbor has 4 cats on her Butterfly weed. I was thinking of moving the cats to my regular milkweed if that is a better host! What do you think, Tony. I have a Butterfly Weed plant that is several years old. It is a beautiful, full plant with lots of orange flowers every year, at first. I read that it’s suppose to bloom throughout summer but mine only blooms for a short period . It also starts out nice and bushy but by the time the flowers bloom it splits down the middle. Normally I would have divided a plant that looks like this but I am afraid to divide this one. Any suggestions on what I should do to encourage longer bloom time and whether or not to divide it and when? Also I have never seen it produce seed pods. I live in Michigan, if that’s a factor. Hi Sharon, our plants are not mature enough for division so haven’t tried, but we have had a lot of success with transplanting. You might try a fertilizer with a high middle number (phosphorous) to promote blooming. I would try division in early spring when the plant is just starting to put up new growth, or in late summer as it starts to cool. This way, more energy can go into establishing roots instead of foliage. The plant is usually more stressed when it has to support both. Strange that yours has not produced seed pods…we have had pods in both full sun and partial shade. Perhaps the soil needs to be amended? Good luck with your plants! strange…but i have 2 two year old milkweed plants that bloomed profusely all summer, yet, produced NO seed pods. tons of pollinators & monarch caterpillars frequent the two, too. last year, they produced an unbelievable amount of seed; so much so i struggled to keep up! sooooooooo, what’s up with THAT? Hi John, the only thing I can think of is that the caterpillars put them behind schedule for seeding by eating down the stems. Our “hello yellow” cultivar had more flowers this season, was definitely visited by pollinators, but also didn’t produce seed…I’ve heard this is more common for that cultivar though. Thank you for the information. 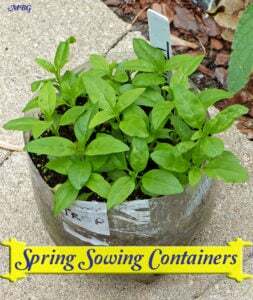 Can I grow butterfly milkweed in containers. What size of pot do you suggest I start with and keep them in? Do you have any tips in growing them indoors during the winter months? Hello Vi, Asclepias tuberosa can be grown in containers. I would suggest about a 14″ pot to start. You may have to transplant. Cutting back the root system might work too if there is little foliage on the plant when you do it. Good luck! My Hello Yellow was planted 2 years ago and it’s looking great this year and has really grown -maybe because we had so much spring rain. I have three plants and they are growing in a raised bed and in full sun. They did have have aphids last year but this year seem to be free of any pests. I am seeing Monarchs, Black and yellow swallowtails and Painted Ladies so far but no eggs that I can tell. They have a medium tall mounding habit and look really good planted with pink petunias in front of them. I also have lavender planted in the same bed . I did plant two tropical milkweeds at the end of the same bed and am watching every day for cats. Keeping my fingers crossed. Thanks Tony for all the great information! Hi Sonia, congrats on all your early butterfly activity. I just found a baby caterpillar in the buds of our “hello yellow” today…keep looking and good luck! Thanks so much for getting back with me so quickly!! I truly appreciate your time & expertise, Patience, and willingness to share!! Hi Tony, thank you for the great information. 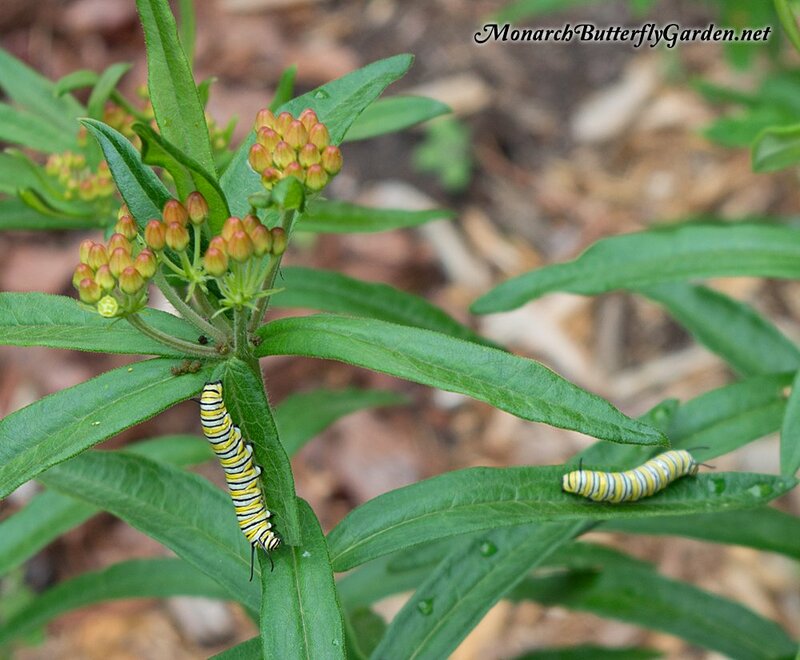 I am new to the Butterfly Weed for Monarchs. Forgive my ignorance, but is the Butterfly Weed considered a shrub, plant or grass?? Thanks in advance for your reply! Hi Jean, butterfly weed is a milkweed plant. We grew butterfly weed at Falls of the Ohio State for several years. Monarch larva were all over it! Hey Tony ! I hope you’re well. If steaks not available we’ll settle for hamburger. Tropical is the Steak although it’s perennial in only 5% of the country. Big Nursery promotes it because the customer has to buy it every year and it’s easier to produce than tropical . 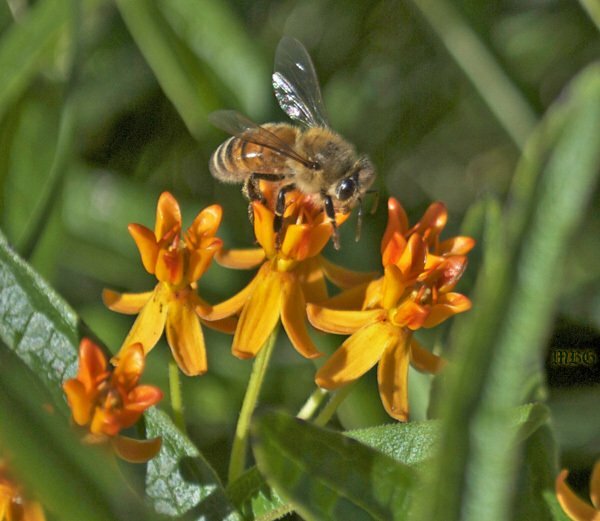 Tuberosa is the milkweed of the future and past. Read its history in the U S and its range. Look for supplies to increase because of the bad mouthing of Tropical. Hi Craig, we grow both steak and hamburger, but we live in a region where E. Coli isn’t a major issue so the tropical bashing isn’t as severe 😉 Because monarchs seem hesitant to use tuberosa as a host plant, I wouldn’t depend on it as the future of milkweed. I’m partial to incarnata because it’s a popular host and nectar plant. I realize incarnata isn’t suitable for dry regions, but it grows very well in containers without a taproot, which makes it a good garden plant for all regions. I have ordered 3 Ascelepias Tuberosa – Hello Yellow plants for my garden (Waystation 7700). Last year I planted the orange variety from seeds and they came up but never got more than 3″ tall. Hope they return and do better this year. I will be planting 6 native varieties of Mw to see what will grow in Baton Rouge, LA. I will always have tropical because the monarchs love it. Something is eating the leaves of my butterfly weed plants… ? aphids ? Hi Clare, if orange oleander aphids are taking over your milkweed they should be visible. If you have an infestation, you can cut off the most affected stems and discard them to cut back on the population for next season since aphids lay eggs in fall. Otherwise, I wouldn’t worry too much about your butterfly weed at this point. 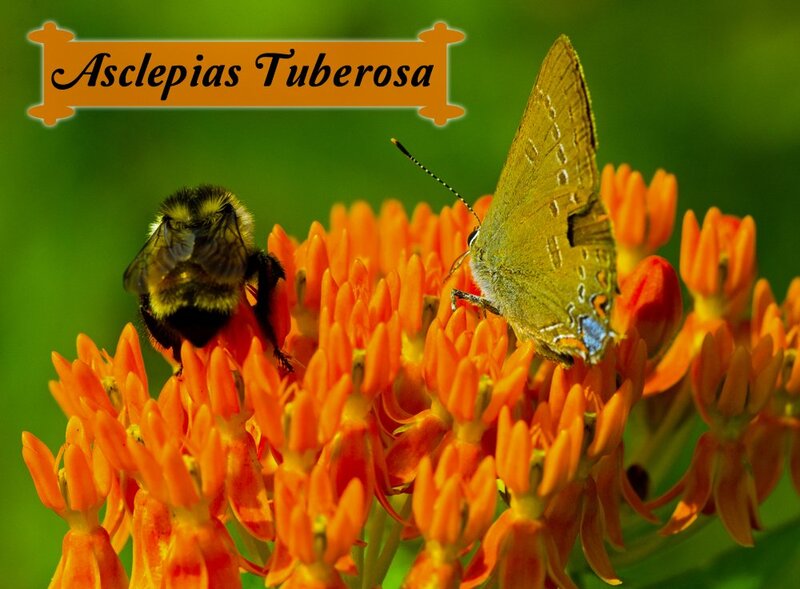 Monarchs typically lay eggs on tuberosa earlier in the season. I just planted a beautiful butterfly weed two days ago. Today, the flowers are completely gone and it looks like the leaves on one of the stems are also devoured. I have groundhogs in the areas but I thought that the butterfly weed was resistant to groundhogs. What else might eat the flowers? Thanks. Hi Judy: groundhogs, rabbits, deer…it would seem many of these critters have adapted to the ‘poisonous’ cardenolides in milkweed. Hi Ellen, glad to hear the fencing solved your milkweed problem…I hope your season picks up soon! Hi Craig, it’s a good nectar plant, and it can be used as a host plant. It’s not usually the preferred host plant though. Another consideration is that tuberosa is a native plant. Even though tropical milkweed is a better host plant, some people refuse to plant it because it’s non-native. My goal is to lay out all the options and let you decide. Why the heck do you have Tuberosa on here if it is NOT A GREAT HOST PLANT? ?